Momma Told Me: The best acting is real acting. I know I watch a lot of really obscure and random shows sometimes; that's the beauty of living in an age where you have instant access to a near unlimited library. My readers are well aware that our household made the decision to ditch cable two years back- and we're still none the worse for it. With digital streaming through a Roku or other device you can often access most major networks content a day or two after it airs. With our busy life- we hardly have time to tune into a live show anyway, so it works out great. Now, in 2010, when I had over 400 channels at my disposal, I was just as picky as ever as to what would get my time and attention. 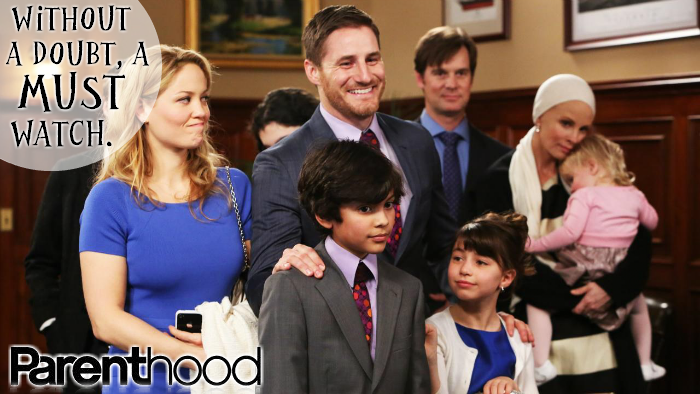 The 1990s show, re imagined by NBC, Parenthood was slow to grab my attention. I don't watch many shows that are real- and no, I don't mean Real Housewives of NJ or Survivor, I mean shows that tell stories of characters with real lives. Lives that could just as easily be yours or mine, lives that most certainly do belong to someone we know, if not us, ourselves. 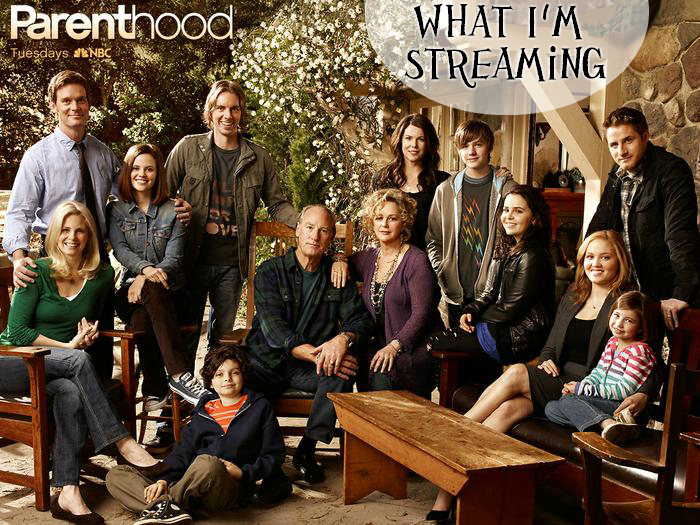 And that is the beauty within the painstakingly crafted drama, Parenthood. It is not just about parents- though it is about the generations of family one elderly couple, the Bravermans, have created. It is about all of the wonderful journeys we take along the way, the decisions we make, and those that are made for us, and how family may not always be defined. If there was ever a TV show that wooed me so unsuspectingly, it has been Parenthood. I have watched it week by week for 5 seasons (and quite possibly what may have been the last.) Lucky for you, you do not need to hold your breath through the tumultuous twists and turns; you can stream it in it's entirety today. But, be warned, the emotions within this show are high and the feelings it may evoke are very real. You will laugh, you will cry (happy and sad tears), and you will triumph with each and every member of this amazing family. Babies will be born, emergencies will be conquered, loss will be share, and romance will most certainly always be complicated, unexpected, and very real. I wish I could sum up the show with a simple plot- in truth it is kind of like watching several min stories that all intertwine. There will be moments where you are painfully glued to your television set, and others where you watch those rolling credits and wonder how the lessons could better apply to your own life. There is always something to be caught in the unexpected glance of a character to another, or the genuine facial expressions. And the Soundtrack- it is perhaps one of the strongest tools the show offers, with beautifully hand-picked music that plays on emotions without a single character's words. Having just watched what could be the show's final episode I am left a little sad, but ultimately forever grateful for the unique glimpse at real life, real family, real triumph, the all-star cast had to offer. What Daughter Says: Sometimes the most we can hope to get from a TV show is a better appreciation of the struggles we've triumphed over and the certainty of love before us. I've never watched the show but I've heard really good things about it. I loved the movie it was based on. I do have Hulu. Maybe I will schedule a marathon. I am streaming it to. Addicted, stayed up too late last night!! Enjoy! I don't know much about this one at all. Thanks for such a heartwarming write up. Now if only I could stream...with my slow DSL it's like watching things in stop motion. I've never watched this show. I'm going to have to check it out! I've been meaning to write a post like this. I've been streaming some interesting stuff lately. I have not yet checked out Parenthood yet. Sounds like a good one. I haven't heard of this show, but I've been looking for a new series to get into. I will check this one out. I've never watched this show before but your description certainly makes it sound interesting. I need to have my husband check into streaming. I have only caught snippets of this show, but I think I want to watch it from the very beginning. How cool is it that we can do that now. Your writeup convinced me that this is the next one I need. I have never seen the show but I know Dax Shepard is in it and I like him a lot - I'll have to check it out at some point. This is probably my most favorite show on TV. Just a warning- have a lot of tissues esp. when you reach this last season. I am totally Parenthood obsessed!